OK so it’s very, very basic and only works on Dynamics Business Analyzer, but it shows what could be done. Maybe something to think about for a BI Power Hour presentation on Crescent? Although until the day comes that we all work in CSI-style labs with large screens to wave our arms around in front of, I seriously doubt it would have any practical use. Anyway, if you wanted to do something truly cool you’d not even bother moving at all and build your reports using the power of your mind – I saw Guy Smith-Ferrier do a very entertaining session called “Mind Control Your Computer in C#” recently, so the idea isn’t as far-fetched as it seems! Here’s something I found out a few weeks ago, just before I went on holiday: installing SP1 for SSAS 2008R2 breaks a PowerPivot installation on the same machine. After I’d installed SP1 on my laptop I found I got an “Unable to open file” error message in PowerPivot whenever I tried to import data, at which point PowerPivot crashed. For me the fix was easy – reinstall PowerPivot and it worked again – but I’m glad I found this out before I needed to use PowerPivot in front of a customer. What is Microsoft’s mobile BI strategy? 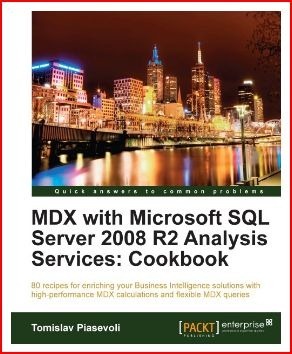 I was one of the technical reviewers on the book, so I’m not even going to pretend to review it, but it’s definitely worth checking out if you’re looking to deepen your knowledge of MDX and see some worked examples. Before I start this post, I’d like to mention that Cathy Dumas of the dev team has started blogging on BISM topics here: http://blogs.msdn.com/b/cathyk/. There are some good posts up already, with more to come I’m sure. 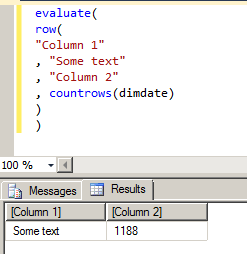 It’s pretty simple: the parameters represent a series of column name/DAX expression pairs for your table, so in this example I’m defining a table with two columns and one row, with the first column returning the text “Some text” and the second column returning the result of the expression countrows(dimdate). I understand it is intended for use by client tools such as Crescent when they want to return a series of grand totals without any detail data. The Generate() function iterates through every row in the table returned by values(DimDate[CalendarYear]) and evaluates the TopN() call in the context of each row; it then unions each top 10 together. In the main query I’m also using the Filter function to remove all the rows returned where there were no sales, just to make the results look tidier. The GenerateAll() function does pretty much the same as the Generate() function, but it will return a row containing null values in situations where the second parameter (in this case, the call to TopN) returns a table with no rows. 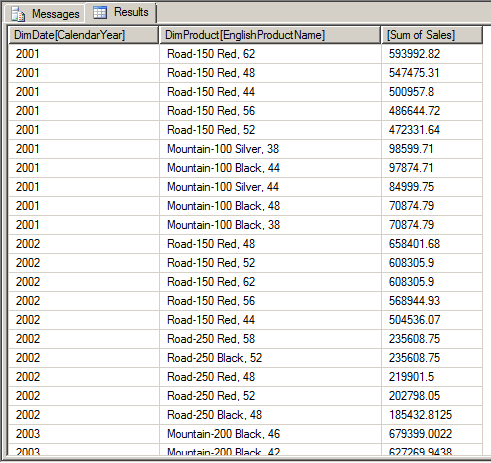 Last of all, I’m using the AddColumns() function to ensure that the Sum Of Sales is added on to the resultset, and also using the Order By clause to ensure that the rows are returned in a meaningful order. In part 6, I’ll look at the Row() function.